Weir-Jones Engineering Consultants are able to implement various types of strain monitoring systems, which provide a comprehensive real-time picture of the pipeline’s state-of-health. These systems enable pipeline operators to detect even the slightest deformation of a pipe caused by the movement of the surrounding soil. 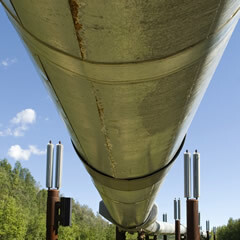 With this valuable data in hand, pipeline operators are able to minimize the risk of events spiraling out of control. This ensures that appropriate responses can be developed in a timely manner. Weir-Jones, through their 30+ years of pipeline strain monitoring, has constantly evaluated new, emerging technologies and then refined the implementation of these to meet the specific requirements of the end user. Currently, there are three primary technologies that Weir-Jones supports and is actively installing. Once the data is analysed for validity and interpreted. Some simple examples of how this data is interpreted are linked below.